Fourth Row Center: Film Writings by Jason Bailey: On DVD: "War Horse"
I guess you could call Steven Spielberg's War Horse "old fashioned," but I wouldn't deploy it as a compliment. Handsomely mounted and utterly sappy, it's the filmmaker's least successful picture since The Lost World: Jurassic Park; it has its moments, but they are undercut by inexplicable choices and the project's utter solemnity about itself. And it is almost entirely undone by the comically overwrought work of composer John Williams, whom Spielberg has allowed to go completely out of control. The film is based on the novel by Michael Morpurgo, which also inspired the current Broadway play. 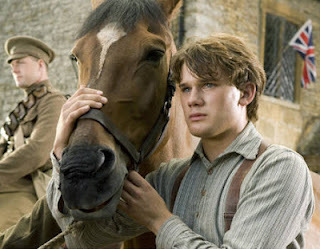 It's the story of Joey, the titular steed, and Albert (Jeremy Irvine), the boy who raises him, trains him, and loves him. The film certainly takes its time getting said horse to said war; the first quarter or so of the film concerns the horse's formative time, as Albert attempts to make Joey into a plow horse, and thus save his family farm. In these village and farm scenes, nestled in lush, rolling hills, Spielberg is clearly going for a quaint, Quiet Man vibe, but it's too precious by a half; he's doing wacky goose cutaways, for God's sake, and Williams's music swells and smothers. As the parents, the venerable character actors Emily Watson and Peter Mullan give their set-in-stone types some spark and weight. Drunk old Dad can't afford to pay the rent, so he sells Joey to the British army (World War I has just begun). We then follow Joey on his travels: from the British army to the Germans, to a French farmhouse, back to the Germans, and, well, you can probably figure it out from there. It's one of those international movies where the German soldiers and the French peasants all speak English (with accents, though! ), rendering a late line complimenting a German soldier's grasp of the language into a bit of a head-scratcher. It must be mentioned that it is a lovely film to look at, every frame a pretty picture; we'd expect nothing less of Spielberg and his regular cinematographer, the great Janusz Kaminski. They fill the film with elegant compositions (the shot with the windmill blades is masterful) and infectious warmth. But they're also altogether too reliant on hero angles and big, slow, low-shot zooms--there are probably as many of the latter as there are lens flares in Abrams's Star Trek, and they start to call attention to themselves. The war battle scenes are (also unsurprisingly) brilliantly staged, though once Spielberg gets to the mushy trench warfare, he's not doing much he didn't already do in Saving Private Ryan over a dozen years back; the blistering, bloody sequence is viscerally effective, but it feels like he's quoting himself. In addition, the stakes are far lower--the film has been so conventional that we're fairly certain how it's going to turn out (as opposed to the confused, anything-goes nature of Ryan's opening battle, before we even knew who anyone was), so there's not much suspense. There, and elsewhere in the third act, the film only really resonates in its pauses. One of those pauses is the picture's best single scene, which finds a British and German soldier putting the battle into a time out. This is a small, human, funny, and rather remarkable encounter, and it's so well observed and believable that it only draws our attention to how phony the rest of the film is. Some of that's the writing; some of it is the director's too-presentational staging. But (not to beat a dead horse, ha ha ha) much of that is Williams's overstuffed and nonstop music, which can take even the most finely-tuned encounter and slather it in so much string-assisted artificiality as to render it all into Hollywood pap. His music doesn't trust the audience to feel anything on its own and, ultimately, neither does Spielberg's film. There are moments, here and there; the way the Frenchman protects his granddaughter, the horse's climactic run (it's nearly as thrilling as Williams's score keeps insisting it is), and the real emotion worked up in the third act. But a good ending does not a great movie make. War Horse offers a lot of pretty pictures, but not much more. "War Horse" is out tomorrow on DVD and Blu-ray. In Theaters: "Damsels in Distress"
In Theaters: "Comic-Con Episode IV: A Fan's Hope"